Currently, there are over 300,000 lumbar discectomies performed in the US annually without an objective standard for patient selection. A prospective clinical outcome study of 200 cases with 5-year follow-up was used to develop and validate an MRI-based classification scheme to eliminate as much ambiguity as possible. 100 consecutive lumbar microdiscectomies were performed between 1992 and 1995 based on the criteria for “substantial” herniation on MRI. This series was used to develop the MSU Classification as an objective measure of lumbar disc herniation on MRI to define “substantial”. It simply classifies herniation size as 1-2-3 and location as A-B-C, with inter-examiner reliability of 98%. A second prospective series of 100 discectomies was performed between 2000 and 2002, based on the new criteria, to validate this classification scheme. All patients with size-1 lesions were electively excluded from surgical consideration in our study. 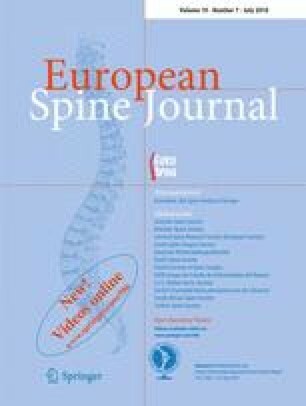 The Oswestry Disability Index from both series was better than most published outcome norms for lumbar microdiscectomy. The two series reported 96 and 90% good to excellent outcomes, respectively, at 1 year, and 84 and 80% at 5 years. The most frequent types of herniation selected for surgery in each series were types 2-B and 2-AB, suggesting the combined importance of both size and location. The MSU Classification is a simple and reliable method to objectively measure herniated lumbar disc. When used in correlation with appropriate clinical findings, the MSU Classification can provide objective criteria for surgery that may lead to a higher percentage of good to excellent outcomes.